Teachers, librarians, book store owners! 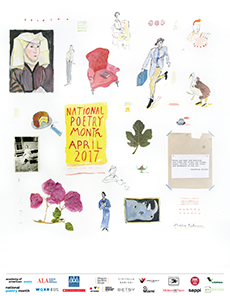 Follow this link for a FREE POSTER created by artist Maira Kalman — who happens to be great! — commissioned by the Academy of American Poets in celebration of National Poetry Month. The organization distributes more than 100,000 free posters to schools, libraries, and bookstores from sea to shining sea. Just click on the link to fill out the easy form while supplies last. Support poetry, share your love for the written word, and beautify your wall. Sorry I could make that image bigger, but it’s the best I could find. National Poetry Month is the largest literary celebration in the world, with tens of millions of readers, students, K-12 teachers, librarians, booksellers, literary events curators, publishers, bloggers, and, of course, poets marking poetry’s important place in our culture and our lives. encourage support for poets and poetry.